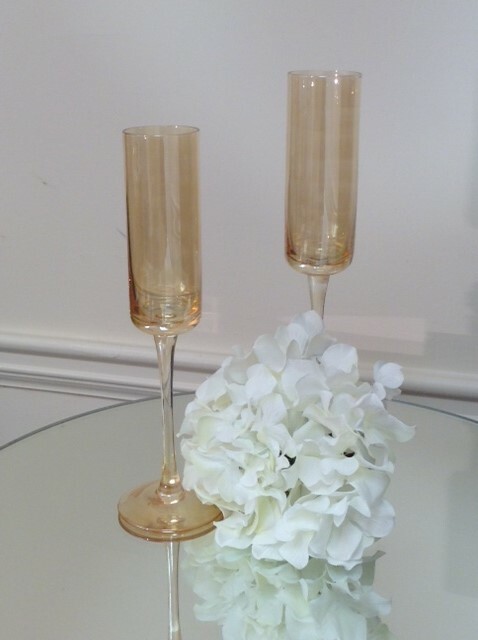 This elegant gold look with highlight any décor with our clean lines. 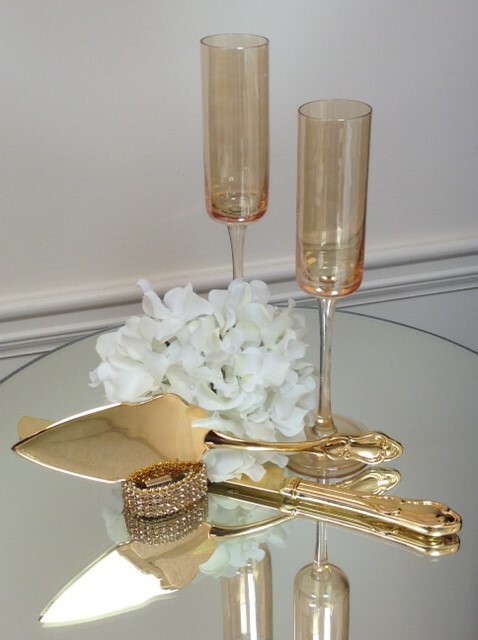 The translucent gold luster optic glass flutes and the gold plated classic server set. Care for the set hand wash only. 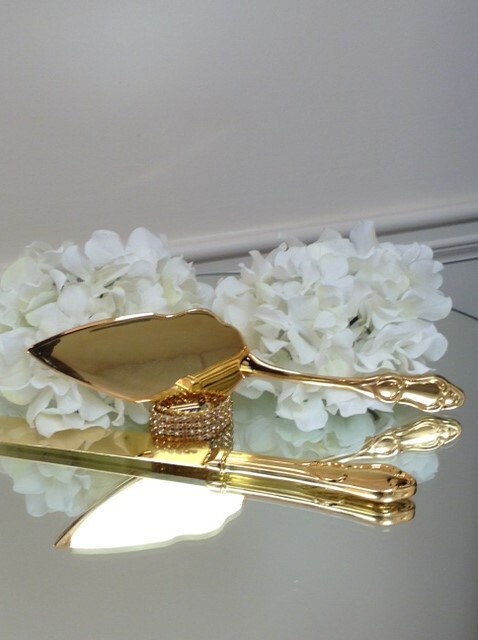 Nothing else sparkles like Gold! ! The Clean contemporary lines and a translucent gold luster elevate, making this a excellent choice for any décor. Each flute measures 10.4"tall x 8oz. measuring 6" long and 1.5" wide. 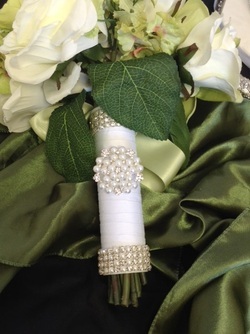 This holder come with 4 rows of Clear & White Pearl Crystal Ribbon on each end of the holder in your choice of ribbon and a Clear Crystals & White Pearl Brooch med way to the top. This Bride & Groom Monogram Silhouette Cake Topper will stand out with the Monogram Letter hand decorated with Swarovski Crystals. The topper is made of mirror acrylic and the topper measures 5"hx5.5"w with a 2.5" monogram letter. You pick the crystal color and the letter. You have 5 fonts to choose from. The are Bridal Script, Edwardian, Victorian, and Block. 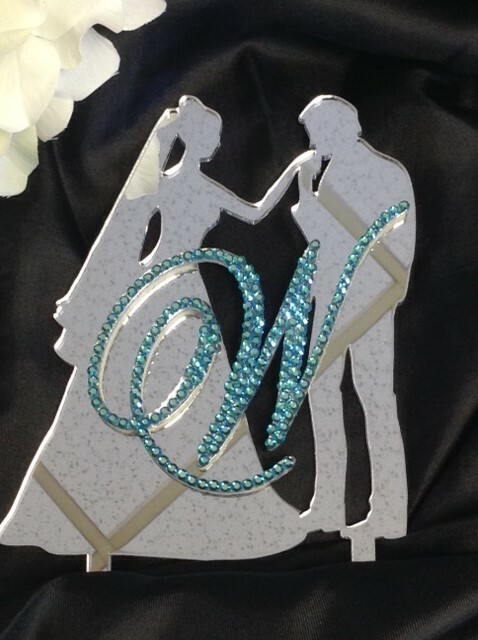 Featured in the picture is the Bridal Script font letter "W"with Aquamarine Swarovski Crystals.